Meet Formula Drift’s Brody Goble & his Drift Car & Experience a Virtual Reality Experience leaving you feeling sideways – You will feel like you are on the track with him! Get ready for smoke and some side ways action. Catch all of this only at the Drive Marketing Group Booth! Brody Goble has been competing in as a Pro2 Driver Formula Drift and will make his Pro1 debut this year. 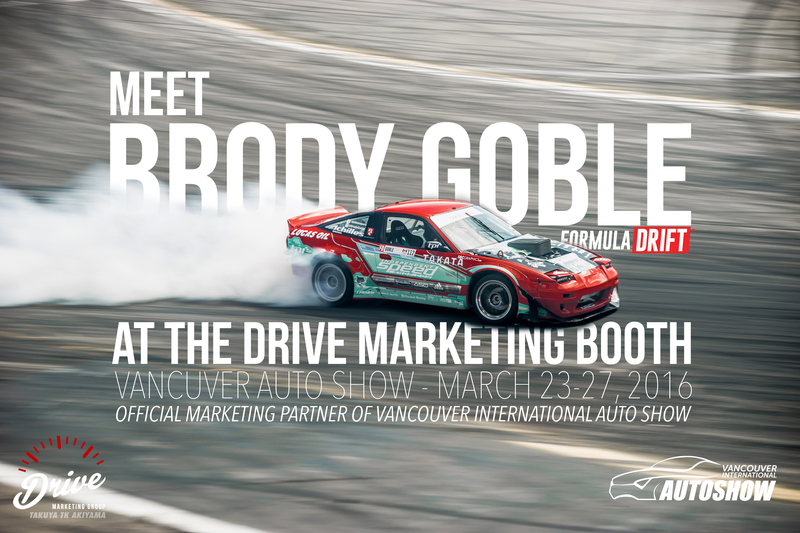 Look for him all across North America creating clouds of smoke where ever he competes & look for his Drift Car’s first 2016 appearance – Only at Vancouver International Auto Show. Drive Marketing Group, a sponsor of Brody Goble, is Vancouver’s #1 Automotive Marketing Agency providing innovative marketing initiatives for manufacturers, dealers, parts, & the entire automotive community.